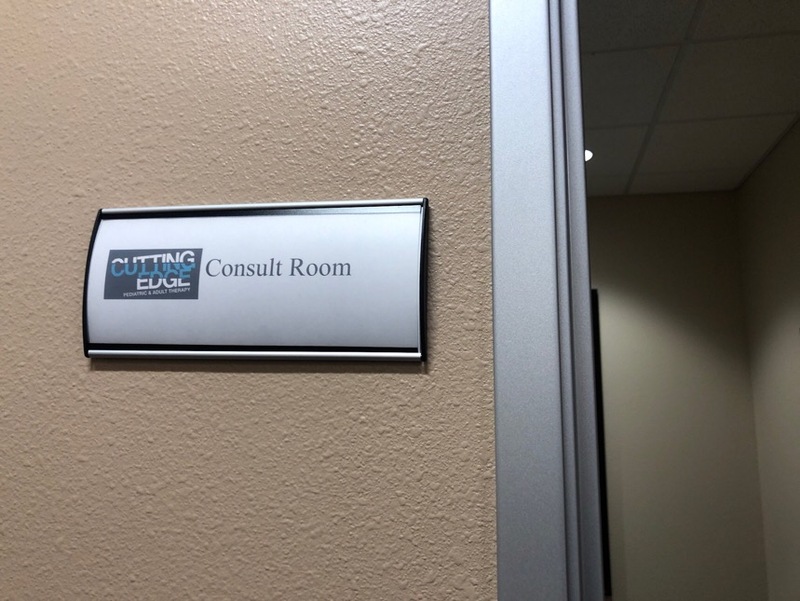 Today I’d like to tell you about our Consultation Room. This room is right near the waiting area. This room is set up for multiple purposes but we mainly use it for parent meetings. If you’ve been here for an initial evaluation you’ve probably been in this room! This is the room where the therapists go over reports. If they need to pull you back for a private meeting, they’ll pull you into this room. Sometimes even if we do a phone consult we do it in this room because it’s quiet and private. What If My Child Has Siblings? We have it set up with a table that everyone can sit around. We always have some toys in here because very often there’s a young sibling in here with the parents. We have cards for the things we refer to in here so that we can give you direct information for referrals. We also have information sheets that we can give you to give you more information on a lot of the terms we use, like what we mean when we talk about certain types of sensory characteristics, and the pyramid of arousal and regulation. We have a lot of user-friendly things for you to look at so that we can easily explain the reports to you. One thing I particularly love about this room is that this is where we have our student board! This is where we have pictures of all of our students from the last 18 months to two years. The ones at the top are our much older students, and the ones at the bottom are new. Some of the pictures at the bottom are of our fieldwork students who will be with us for six, eight or 12 weeks, from all three disciplines of occupational, speech and physical therapy. We love to be a learning and teaching facility, so we have partnered with a couple of dozen universities across the country to assist in helping their students get fieldwork. We do this because we believe we can offer a unique training experience here and contribute to the field, and help to create great clinicians. I taught as an adjunct professor for three or for years at Texas Woman’s University, so I’ve always been passionate about teaching. I think we really need to create the best clinicians we can have. So the bottom rung of pictures you’ll see some of our newest folks. Make sure you say hello to them! And hopefully, you’re only in this Consultation Room for an initial consult and not need to be drawn back in here for any particular reason. But know that we respect your privacy and we always want to make sure we are communicating clearly, so we will always take that extra step to bring you into this room if we need to go over something.